If your teen daughter mentions “whale tails” and you think she’s talking about a cruise to Alaska, you need to learn a thing about current fashion before you hit the mall for back-to-school shopping. With the rise in popularity of low-rise jeans, whale tails have become a popular fashion statement. Basically it involves showing off the whale-tail shaped piece of fabric at the top of a pair of thong underwear. Wikipedia even has a page devoted to the art of showing off a whale tail. And … unfortunately, I’ve seen a few in church. The fact is that modesty has gone by the wayside in our culture and even in our churches. The concern goes much deeper than skimpy fashion that provides a passing temptation for teen boys and men. The fact is that our over-sexualized fashions for younger and younger girls are having long-term harmful effects. The American Psychological Association published a report from its task force on the sexualization of girls which stated that the music lyrics, internet content, video games, and skimpy clothing now being marketed to girls are being linked to eating disorders, low self-esteem, depression, and many more problems. Studies that analyze the risk of teen sexual activity consistently point out that a girl who looks older than she is has a greater risk of becoming sexually active. According to the APA, early sexualization has “negative consequences on girls’ ability to develop healthy sexuality.” As a Christian woman who has read this report, I translate that to mean that when a girl is finally a young married woman, she has so many body image issues (from being unable to attain air-brushed perfection) and scars on her heart from multiple relationships (sometimes sexual) that she has a hard time enjoying the gift God meant for her to give and receive freely within her marriage. Moms, this is not just about what we allow our daughters to wear. 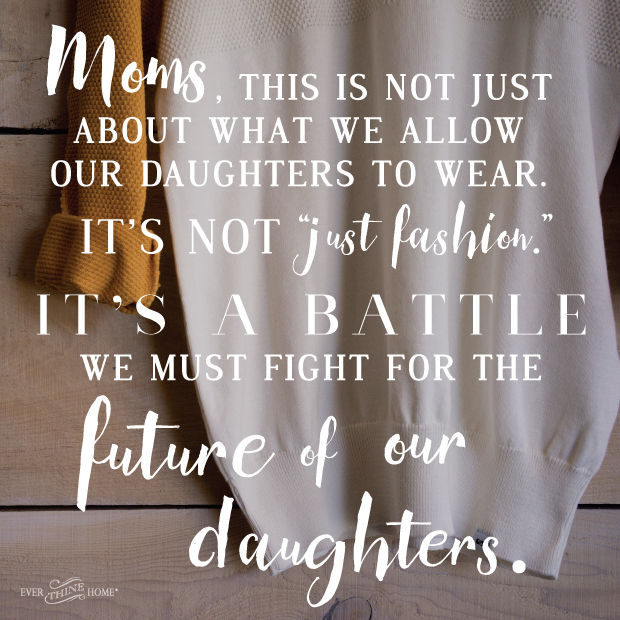 It’s not “just fashion.” It’s a battle we must fight for the future of our daughters. Teaching girls to show off the heart, and not the body. I’m not suggesting that we dress our girls like school marms. My daughters are fashionably cute, but modest. They don’t stand out as fashion losers, though I say “no” to a lot of trends. Turn the TV off. You don’t have to avoid television altogether; just watch less and be careful what you watch. A recent Family Circle magazine article stated that “a 2005 Kaiser Family Foundation report found that the proportion of programs with sexual content rose from 54 percent to 70 percent between 1998 and 2005.” And it’s gotten worse since then. Be careful. And educate yourself concerning the newer television ratings. TV-Y or TV-G is the tamest. Other ratings require you to make a judgment call. You can get the scoop by visiting the Federal Communications Commission website. Monitor other media choices. Evaluate your daughter’s websites, movies, and music. Check to see what her and her friends are sending each other on their phones. Make sure she is receiving messages of value and not simply messages about her physical power and beauty. The issue is not her body; God made it and it is beautiful. The issue is the clothes. When we wait until our daughters mature to address modesty, they often feel self-conscious and guilty about the beauty that’s growing in them. Give her creative ways to evaluate an outfit. When my first daughter, Lexi, was about 8 years old we developed a lot of creative, crazy modesty tests that have become the Secret Keeper Truth or Bare Fashion Tests. We now present them to entire audiences across the nation. They aren’t rules, but funny tests that help a girl go into her own heart to decide if something is modest or not. There’s “Grandpa’s Mirror”: Sit in front of the mirror with your legs crossed in shorts or a skirt so she can check to make sure her underpants don’t show when she sits down. There’s also the “Spring Valley Test” that helps a girl decide if a shirt is too tight. You can view them all at www.secretkeepergirl.com, or develop your own. Teach her to think critically. It is so important to help your daughter be part of the process in deciding what is modest and what is not. Involving our girls gives them critical skills to use God’s word as a measuring stick for their cultural indulgences. Finally, teach her what God thinks about her beauty and how to present it. First Timothy 2:9-10 says, “Women should adorn themselves with respectable apparel, with modesty and self-control, not with braided hair and gold or pearls or costly attire, but with what is proper for women who profess godliness with good works.” This verse doesn’t say she can’t have a cute hairstyle or a cool pair of earrings. It does say that everything should be done in moderation. I always challenge my girls with this question: Did you spend more time in front of the mirror working on your hair and clothing or more time in God’s Word working on your spirit? Focus on internal beauty and the Lord will give her a moldable spirit toward your standards of modesty and true beauty! Until then, stay strong during this back-to-school shopping season. If you find yourself in a moment—and you will—when you wonder if this is a battle that’s really worth fighting, think about the innocence God places in our children. That precious girl of yours is worth a few arguments over bra straps! This article originally appeared on familylife.com. Thank you for this timely article. I am a great grandmother and agree one hundred percent with you. Our churches have changed so much that we now allow a dress code (even our pastors) to meet the changes of the world instead of keeping the church as a place to honor God and to dress accordingly. We can’t tell the church from the World anymore by the way even adults dress so why do we expect our kids to be any different. Our Heavenly Father deserves our very best! Thank you for your article! I love reading about women still thinking about Modesty. There are so many women, even in church, that don’t care anymore or that just don’t believe it’s an issue. My daughter is 13 and I have had many conversations with her about modesty. I’m lucky so far she is still interested in covering up. I wrote a blog on modesty and I have had some strained friendships ever since then. Some women just don’t view it as necessary anymore. It’s really sad. We need to protect our boys and our men. We can’t be a stumbling block for our men that are trying their best to live for the Lord. I was really enjoying this comment until the comment about the men. Modesty is not about being or not being a temptation to men. It is about loving God more than the latest fashion. About having a heart for God’s word. Men are going to be tempted no matter how covered up you are. Thanks for your article and all your suggestions, like teaching her to think critically and teaching her her worth according to God’s standards. Raising a modest girl in this society is not easy, but it can be done. I think the biggest key is keeping a relationship with her where she feels comfortable to talk to you about anything and where your first response is not to criticize or judge. At least that worked in our household.